Goals by Jake Hastie and Allan Campbell earned Motherwell a 2-1 victory at St Mirren on Wednesday night which saw the Steelmen go up two places to seventh in the Scottish Premiership table, writes Craig Goldthorp. Motherwell's fifth consecutive league win means that they are just four points behind sixth placed St Johnstone, who lost 2-1 at Hamilton Accies on the same night. Curtis Main's early effort from a tight angle was saved by Saints keeper Hladky, as Motherwell tried to gain an early advantage in Paisley. 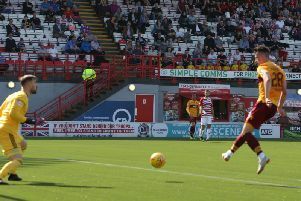 But Motherwell soon hit the front in spectacular fashion when Jake Hastie took an Alex Gorrin pass, sprinted inside past two St Mirren players and blasted the ball home off the underside of the bar with his left foot from outside the box. After a slick passing move by the hosts, Motherwell goalkeeper Mark Gillespie then made a fine stop to turn Anders Dreyer's powerful shot around the post as St Mirren tried to hit back. Saints then wasted a great scoring chance when Kyle McAllister shot far too high from a central position after good build-up play down the right. After St Mirren's Brad Lyons had a header saved, play raged to the other end where Hastie's header was off target. Leading 1-0 at the interval, a free-kick from a tight angle by Motherwell's David Turnbull's was saved early in the second half. Motherwell then missed an incredible opportunity to extend their lead when Main fluffed his close range effort from a Hastie cross following a swift counter attack also involving Campbell and Gboly Ariyibi. Main's left footed shot from a Turnbull pass missed the target before Turnbull took a Tait pass and sent in a low effort that was saved by Hladky. After a Turnbull pass, Main then had another great chance but his effort was blocked by Popescu. And Motherwell paid for the miss when, after an original corner was cleared, Paul McGinn looped a header into the net to score for Saints after a cross by Dreyer. But the visitors regained their lead almost instantly when Allan Campbell found space in the box to head home after a brilliant delivery from the left by substitute Elliott Frear. The Motherwell supporters behind that goal went berserk as Motherwell's heroes celebrated right in front of them. Frear and Turnbull then both had efforts saved for Motherwell as the Steelmen finished strongly. And the visitors held on for a result which gives them a genuine chance of sealking top six football this season with eight games remaining until the split. Motherwell will next be in league action at home to Hearts on Sunday, February 17. Motherwell: Gillespie, Tait, Aldred, Campbell, Main, Ariyibi (Frear 64), Grimshaw, Dunne, Gorrin (McHugh 61), Turnbull, Hastie (McCormack 82).